Married Name Her married name was Seippel. Flora Fullman married Theodore Seippel. Married Name 26 September 1944 As of 26 September 1944,her married name was Simon. Fannie Seippel was the daughter of Theodore Seippel and Flora Fullman. Fannie Seippel married Francis B. Simon, son of Henry John Simon and Gertrude Stelpflug, on 26 September 1944. Francis B. Simon was born on 16 November 1922. He was the son of Henry John Simon and Gertrude Stelpflug. Francis B. Simon married Fannie Seippel, daughter of Theodore Seippel and Flora Fullman, on 26 September 1944. Francis B. Simon died on 1 July 2008 at age 85 Francis B. Simon, age 85, of Bloomington, died Tuesday, July 1, 2008 at the Lancaster Care Center. He was born November 16, 1922 in Potosi, WI, the son of Henry and Gertrude (Stelpflug) Simon. On September 26, 1944, he married Fannie Seippel in Bloomington. He started working for farmers and eventually became co-owner of a farm near Mount Hope. He farmed from 1950 1970 and then moved to Bloomington in 1971. Francis worked for Wisconsin Dairies and retired in 1988. He enjoyed hunting and fishing. Francis was a loving husband and great father and father-in-law. 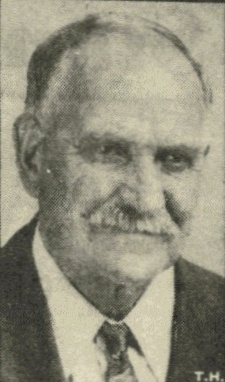 He is survived by his wife, Fannie Simon, Bloomington; two children: Dawin (Bev Crapp) Simon, Bloomington; and Karen Simon, Lancaster; three grandchildren: John (Michelle) Simon, Vinton, LA; Eugene (Colleen) Simon, Tampa, FL; and Brenda (Kevin) Riedl, Cassville; five great-grandchildren: Trevor, Nicklas, Eleanor, Cody, and Dylan; one brother, Cletus Simon, Dickeyville; one brother-in-law, John (Irene) Seippel, Lancaster; one sister-in-law, Lillian (Merlin) Bertjens, Kieler; and many nieces, nephews, other relatives, and friends. He was preceded in death by his parents; a brother, Lavern; and two sisters in infancy. Private funeral services were held at Schwartz Funeral Home in Lancaster and burial was in Hillside Cemetery Lancaster. Public visitation was held from 3:00 7:00 p.m. on Thursday, July 3, 2008 at the Schwartz Funeral Home in Lancaster. 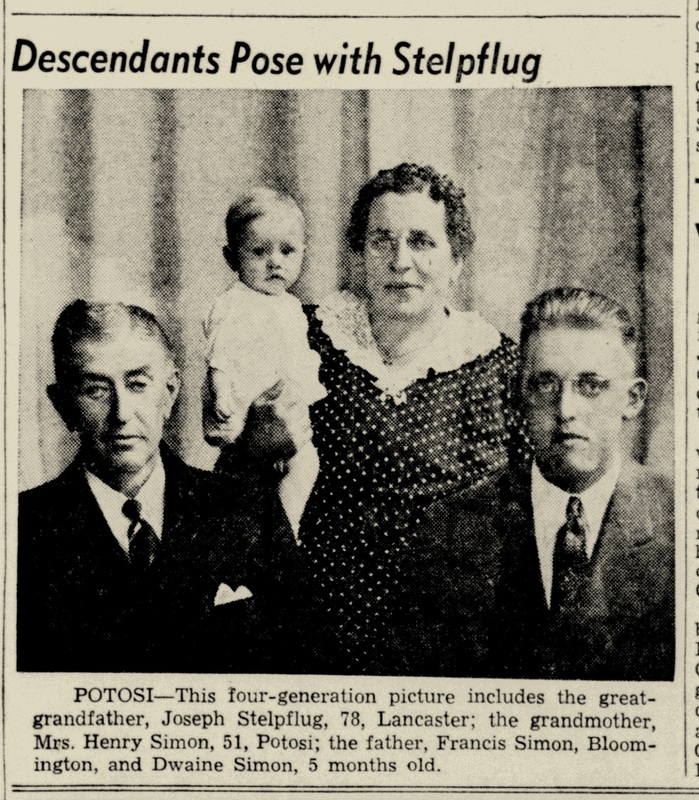 In June 1946 at Wisconsin Four generations Joseph Stelpflug, Gertrude (Stelpflug) Simon, Francis Simon, Dwaine Simon. Henry Seippel was the son of Theodore Seippel and Flora Fullman. Henry Seippel died before July 2010. Married Name Her married name was Groom. Viola Seippel was the daughter of Theodore Seippel and Flora Fullman. Viola Seippel married Les Groom. Viola Seippel died before July 2010. Les Groom married Viola Seippel, daughter of Theodore Seippel and Flora Fullman. Les Groom died before July 2010. Married Name Her married name was Atkinson. Melinda Seippel was the daughter of Theodore Seippel and Flora Fullman. Melinda Seippel married (?) Atkinson. Melinda Seippel died before July 2010. (?) Atkinson married Melinda Seippel, daughter of Theodore Seippel and Flora Fullman. Name Variation Valentine Hinderman was also known as Val. Valentine Hinderman was born on 29 December 1863 at Dickeyville, Grant, Wisconsin. He was the son of Joseph Hinderman and Regner Hellburg. Valentine Hinderman married Magdalena Thor, daughter of (?) Thor, on 24 November 1891. Valentine Hinderman died on 5 January 1947 at Dickeyville, Grant, Wisconsin, at age 83 Valentine Hinderman obituary. In November 1923 attended suprise party for Mr and Mrs Ed Hinderman. Valentine Hinderman was AA FREEDOM CERTIF. 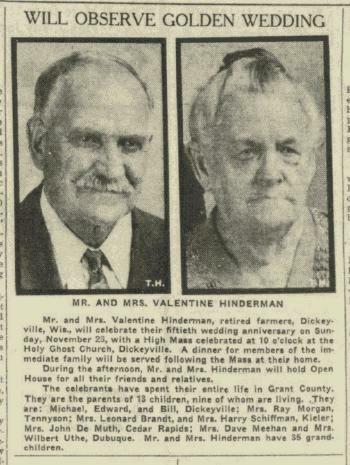 On 23 November 1941 at Dickeyville, Grant, Wisconsin; Valentine and Magdalena (Thor) Hinderman 50th wedding anniversary celebration. [S247] U.S. Federal Census 1870 U.S. Federal Census, by Ancestry.com, Year: 1870; Census Place: Paris, Grant, Wisconsin; Roll: M593_1717; Page: 337B; Family History Library Film: 553216. [S246] U.S. Federal Census 1880 U.S. Federal Census, by Ancestry.com, Year: 1880; Census Place: Paris, Grant, Wisconsin; Roll: 1427; Family History Film: 1255427; Page: 280A; Enumeration District: 120. Name Variation Magdalena Thor was also known as Lena (?). Name Variation Magdalena Thor was also known as Helena. Married Name 24 November 1891 As of 24 November 1891,her married name was Hinderman. Magdalena Thor was born on 22 October 1873 at Kieler, Grant, Wisconsin. She was the daughter of (?) Thor. Magdalena Thor married Valentine Hinderman, son of Joseph Hinderman and Regner Hellburg, on 24 November 1891. 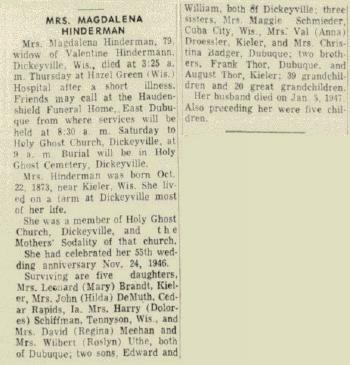 Magdalena Thor died in May 1953 at Hazel Green, Grant, Wisconsin, at age 79 Magdalena (Thor) Hinderman obituary. 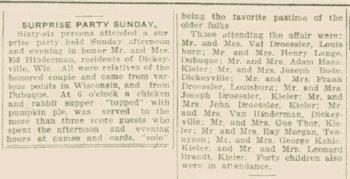 In November 1923 attended suprise party for Mr and Mrs Ed Hinderman. Magdalena Thor was AA FREEDOM CERTIF. On 23 November 1941 at Dickeyville, Grant, Wisconsin; Valentine and Magdalena (Thor) Hinderman 50th wedding anniversary celebration. Married Name Her married name was DeMuth. Name Variation Hildagarde Hinderman was also known as Hilda. Hildagarde Hinderman married John DeMuth. Hildagarde Hinderman was born circa 1909 at Wisconsin. Hildagarde Hinderman died after 1969. Name Variation Regina Hinderman was also known as Jean. Married Name February 1935 As of February 1935,her married name was Meehan. Regina Hinderman was born circa 1914 at Wisconsin. Regina Hinderman married John David Meehan in February 1935. Regina Hinderman died after 1969. Michael Hinderman married Clara (?). Michael Hinderman was born on 7 March 1893 at Dickeyville, Grant, Wisconsin. He was the son of Valentine Hinderman and Magdalena Thor. Michael Hinderman died in May 1944 at Hazel Green, Grant, Wisconsin, at age 51 Michael Hinderman obituary. Name Variation Edward J. Hinderman was also known as Ed. Edward J. Hinderman was born on 1 August 1897 at Dickeyville, Grant, Wisconsin. Edward J. Hinderman married Katherine Droessler, daughter of Joseph Droessler and Caroline Wiederholt, before 1924. 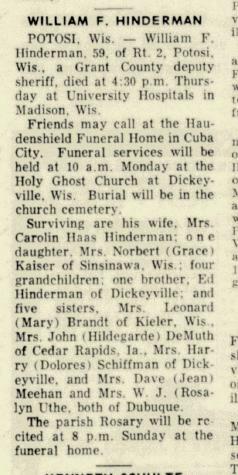 Edward J. Hinderman died on 19 March 1974 at Cuba City, Grant, Wisconsin, at age 76. Married Name 3 October 1922 As of 3 October 1922,her married name was Brandt. Mary L. Hinderman was born in 1903 at Wisconsin. Mary L. Hinderman married Leonard S. Brandt, son of Louis Brandt and Victoria Wiederholt, on 3 October 1922 wedding license issued week ending 23 Sept 1922. Mary L. Hinderman was buried in 1976 at Immaculate Conception Church Cemetery, Kieler, Grant, Wisconsin. In November 1923 attended suprise party for Mr and Mrs Ed Hinderman. On 2 February 1936 at Kieler, Grant, Wisconsin, attended Frank and Louise (Gunderman) Richard 18th wedding anniversary celebration. William F. Hinderman married Caroline Haas, daughter of Adam John Haas and Regina M. Droessler. William F. Hinderman was born circa 1907 at Wisconsin. William F. Hinderman died in February 1966 at Madison, Dane, Wisconsin, William F Hinderman obituary. Name Variation Dolores Christine Hinderman was also known as Doloris. Name Variation Dolores Christine Hinderman was also known as Deloris. Married Name November 1929 As of November 1929,her married name was Schiffman. Dolores Christine Hinderman was born circa 1913 at Wisconsin. Dolores Christine Hinderman married Harry L. Schiffman, son of Engelbert Schiffman and Sarah Beyer, in November 1929 Harry Schiffman and Deloris Hinderman engagement announcement. 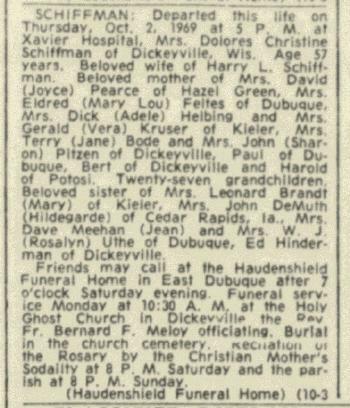 Dolores Christine Hinderman died on 2 October 1969 at Xavier Hospital Dolores Christine (Hinderman) Schiffman obituary. Bertha Hinderman married Ray Morgan. Bertha Hinderman was born circa 1896 at Wisconsin. 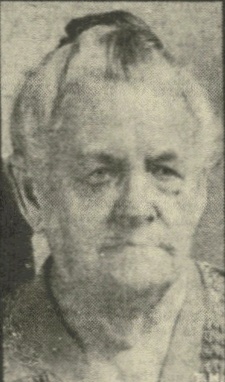 Bertha Hinderman died between 1947 and 1953. 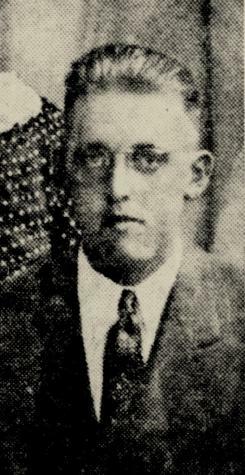 Adolph Hinderman was born circa 1900 at Wisconsin. Adolph Hinderman died before 1953. Ralph D. Wunderlin was born on 2 February 1910 at Wisconsin. He was the son of Francis I. Wunderlin and Maude C. Horner. Ralph D. Wunderlin married Velma M. Pluemer, daughter of Joseph F. Pluemer and Josephine M. Langmeier, before 1945. Ralph D. Wunderlin died in June 1981 at age 71. [S250] U.S. Federal Census 1930 U.S. Federal Census, by Ancestry.com, Year: 1930; Census Place: Harrison, Grant, Wisconsin; Roll: 2574; Page: 2B; Enumeration District: 17; Image: 269.0; FHL microfilm: 2342308. Francis I. Wunderlin was born in 1911 at Wisconsin. Francis I. Wunderlin was the best man at the wedding of Ambrose Stephen Wunderlin and Marie Anna McClain on 14 October 1936 at Holy Ghost Church, Dickeyville, Grant, Wisconsin; Anna Marie McClain and Ambrose Wunderlin marriage announcement. Francis I. Wunderlin married Evelyn Helmer on 7 June 1938. Francis I. Wunderlin died in 1991. Married Name 8 June 1940 As of 8 June 1940,her married name was Eustice. Rose M. Wunderlin was born on 11 July 1915 at Wisconsin. She was the daughter of Francis I. Wunderlin and Maude C. Horner. Rose M. Wunderlin married Sherman Goodsell Eustice on 8 June 1940. Rose M. Wunderlin died on 4 July 2007 at age 91 Rose M. Eustice, 91, of Belmont, died Wednesday, July 4, 2007, at Heartland Health Care Center, Platteville. Services will be at 10:30 a.m. Saturday at St. Mary's Catholic Church, Platteville, with Monsignor Charles Schluter and the Rev. Arnold Reuter officiating. Burial will be in the Belmont Cemetery. Friends may call from 4 to 8 p.m. today at Melby-Bendorf Funeral Home, 1245 N. Water St., Platteville. Friends also may call after 9:30 a.m. Saturday at the church. Rose was born on July 11, 1915, in Harrison Township, Grant County, daughter of Frank and Maud (Horner) Wunderlin. She married Sherman Eustice on June 8, 1940, in Dubuque. She attended Wunderlin rural school and graduated from St. Andrew's Tennyson High School in 1932, and the Platteville Normal School in 1933, with a three-year teaching certificate and later completed the rural course there. She taught nine years in the Brawner, Wunderlin and Whig rural schools in Grant County. Later, she did substitute teaching and tutoring. She and her husband farmed and purchased their own Moundvale farm in 1952. They retired in 1978 in rural Belmont. They were members of the Farm Bureau and Holstein Association where Rose worked as a member of both local and state legislative committees. They led the Mound View 4-H Club for 15 years. She was a member of St. Mary's Catholic Church and Wisconsin Women for Agriculture. She enjoyed reading, attending Holstein events and playing bridge as well as the excitement of farming and teaching. Surviving are her husband, Sherman; three children, Bill, of Hutchinson, Minn., John (Cathleen), of Fridley, Minn., and Josetta McNett, of Belmont; a daughter-in-law, Pat Eustice, of Marshall; a son-in-law, Art McNett, of Rewey; seven grandchildren, Misty (Glen) Ferguson, of Missouri, Josie (Greg) Eustice, of Milwaukee, Matt (Laurie) Eustice, of Sun Prairie, Phil Eustice, of Marshall, Buddy McNett, Chip (April) McNett and Crystal McNett, all of Belmont; three great-grandchildren; a sister, Marietta Tarrell, of Fennimore; and a sister-in-law, Cecelia Wunderlin, of Platteville; and many nieces and nephews. She was preceded in death by her parents; six brothers, Edgar, Leonard, Ralph, Francis, Ambrose, and Walter Wunderlin; and a granddaughter, Amy Joy Eustice. Married Name 19 August 1941 As of 19 August 1941,her married name was Tarrell. Marietta C. Wunderlin was born circa 1921 at Wisconsin. Marietta C. Wunderlin married Melvin C. Tarrell, son of Lloyd Tarrell and Susan Cross, on 19 August 1941. Walter M. Wunderlin was born in 1922 at Wisconsin. 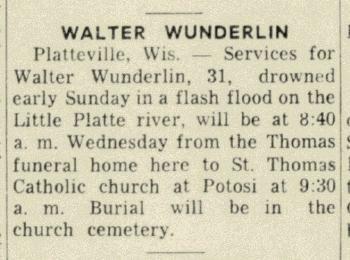 Walter M. Wunderlin died in July 1950 at drowned in the Little Platte River Walter Wunderlin obituary. Sherman Goodsell Eustice was born on 23 October 1917. He married Rose M. Wunderlin, daughter of Francis I. Wunderlin and Maude C. Horner, on 8 June 1940. Sherman Goodsell Eustice died on 27 December 2013 at age 96. Name Variation Melvin C. Tarrell was also known as Pete. Melvin C. Tarrell was born on 11 September 1916 at Wisconsin. He was the son of Lloyd Tarrell and Susan Cross. Melvin C. Tarrell married Marietta C. Wunderlin, daughter of Francis I. Wunderlin and Maude C. Horner, on 19 August 1941. Melvin C. Tarrell died on 20 January 2005 at age 88 Melvin C. "Pete" Tarrell, age 88, passed away on Thursday, Jan. 20, 2005, at Fennimore Good Samaritan Center in Fennimore. He was born on Sept. 11, 1916, in Cuba City, the son of Lloyd and Susan (Cross) Tarrell. He married Marietta Wunderlin on Aug. 19, 1941, in Montfort. He is survived by his wife of 63 years, Marietta of Fennimore; two children, Mary (Rick) Baker of Fennimore, and Lloyd (Paula) Tarrell of Fennimore; eight grandchildren; and 12 great-grandchildren; son-in-law, David Kirk of Cuba City; twin sister, Melda Wilkins of Fennimore; and a brother, Vincent "Bob" of Tarrell of Fennimore. He was preceded in death by his parents; daughter, Connie Kirk on Feb. 9, 2004; great-granddaughter, Baylie Kirk; and brothers, Jack and Frank Tarrell. Funeral services will be held at ST. MARY'S CATHOLIC CHURCH in Fennimore, at 11 a.m. on Monday, Jan. 24, 2005. Monsignor Ganshert will officiate. Burial will be in the church cemetery. Friends may call from 4 p.m. until 8 p.m. on Sunday, Jan. 23, 2005, at the LARSON FAMILY FUNERAL HOME in Fennimore. Edgar L. Wunderlin was born in 1907. Leonard G. Wunderlin was born in 1908. Leonard G. Wunderlin died in 1909. Married Name 1 September 1962 As of 1 September 1962,her married name was Kirk. Connie M. Tarrell was born on 9 February 1942 at Wisconsin. She was the daughter of Melvin C. Tarrell and Marietta C. Wunderlin. Connie M. Tarrell died on 9 February 2004 at age 62 Connie M. Kirk, age 62, of Cuba City, died on Monday, Feb. 9, 2004, at home, surrounded by her family, after a courageous battle with cancer. Connie was born on Feb. 9, 1942, in Lancaster, Wis., the daughter of Melvin "Pete" and Marietta (Wunderlin) Tarrell. She married David L. Kirk on Sept. 1, 1962, in Fennimore. Connie became a charter member of Cole Acres Country Club in 1968. She was a former beautician and clothing store owner. Connie had worked at Cuba City Doctor's Clinic and currently worked for Medical Associates Health Plans in Dubuque, Iowa. She enjoyed golfing, was an avid White Sox fan, and was a country music lover. Connie loved to spend time with grandchildren, family and friends. She is survived by her husband, David of Cuba City; a daughter, Jill (Fred) Kuhl of Hazel Green; two sons, Brad (Kim) Kirk of Milton, and Lance (Chris) Kirk of Dubuque, Iowa; her parents, Melvin "Pete" and Marietta Tarrell of Fennimore; two sisters, Mary (Rick) Baker of Fennimore, and Faye (James) Meier of Davis, Ill; a brother, Lloyd (Paula) Tarrell of Fennimore; and seven grandchildren, Katelyn Kirk, Morgan, Madison, Jaxin Connie and Briar Kuhl , and Dalton and Sydni Kirk. Connie was preceded in death by a granddaughter, Bayli Jo Kirk. Services will be 10:30 a.m. on Friday, Feb. 13, 2004, at ST. ROSE OF LIMA CHURCH, Cuba City, with the Rev. David Flanagan officiating. Burial will be in the church cemetery. Friends may call from 3 p.m. until 8 p.m. on Thursday, Feb. 12, 2004, at CASEY FUNERAL HOME, Cuba City, where the parish wake service will be at 3 p.m.
Name Variation Catherine Fure was also known as Kate. Married Name circa 1874 As of circa 1874,her married name was Wunderlin. Catherine Fure was born on 20 January 1856 at Wisconsin. She married Ignatius Wunderlin circa 1874. Catherine Fure died on 4 November 1926 at age 70. Catherine Fure had 11 with 11 living in 1900 children. She had 11 with 10 living in 1910 children. [S244] U.S. Federal Census 1910 U.S. Federal Census, by Ancestry.com, Year: 1910; Census Place: Harrison, Grant, Wisconsin; Roll: T624_1710; Page: 1A; Enumeration District: 0025; FHL microfilm: 1375723.